AWARD WINNING BBQ CATERING, SPICES & SAUCES...A family affair! We have been very blessed with the success and expansion of Pete's Firehouse BBQ. Our specialty is catering weddings. We are truly honored when a couple selects Pete's Firehouse BBQ to cater there very special day. We take that very seriously and realize that a wedding is a once in a lifetime event. We will do everything we can to make it perfect. On average, we cater approximately 50 weddings each year and work very closely with the couple to ensure that our services are tailored specifically for their day. We understand that no two couples are alike, and thus no two weddings are the same. Pete, our pitmaster, has been BBQ’ing since he was tall enough to reach the grill. Many years ago we discovered what real BBQ was, cooking meat low and slow over real wood. We bought our first smoker, and the rest is history. In 2008 we developed our first BBQ spice rub for our own use. Our Original Rub we developed for pork and chicken. For Christmas one year, we gave people mason jars of our rub. Well shortly after that, folks were asking for more, and so it began. We have since developed two BBQ Spice Rubs, our Pete’s Firehouse BBQ ORIGINAL Rub and our Santa Maria Style Rub. In 2011 we finally bottled our own Pete's Firehouse BBQ Sauce! We are extremely proud that all of our BBQ Spice Rubs and Sauce are ALL-NATURAL, GLUTEN FREE, and contain NO High Fructose Corn Syrup, NO MSG, and use NON-GMO products. Also in 2008 we entered our first BBQ Competition and have been hooked ever since. We have done very well in competitions, especially being a new team to the circuit. The "Pete's Firehouse BBQ" Family! Our FIRST PLACE Burger at the 2012 OC BBQ Festival. 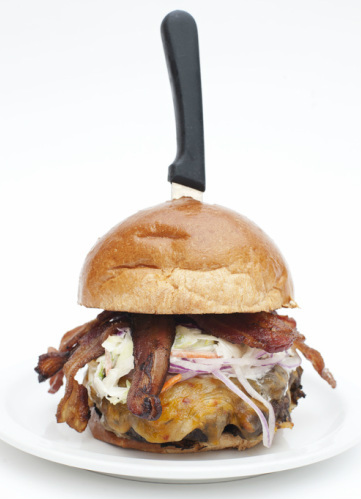 This is the September Burger of the Month at Slater's 50/50 Restaurants! Reserve Grand Champions, 2011 Stagecoach Country Music Festival!